You know a disease or disorder has arrived when it finally gets an acronym! And if the “Grey Lady” prints invitations to a disease’s “coming out party,” it’s too late to send your RSVP. So here’s the NYT’s bulletin: ADD and ADHD are spreading like STDs. Question: Why are America’s children having trouble focusing? In some states an estimated 23% of them can’t seem to stay on task. Does that mean they can’t read anything longer than a tweet? Are they caught up in an epidemic? Why are they so easily distracted? Answer: They don’t know which bone to chase. Let’s try this experiment. You need just three things. For the millions of you who have trouble concentrating. They are listed below with graphics. With these ingredients, you’ll have the full attention of one drooling hound dog. Next, quickly throw all of the bones in different directions. For best results, throw the bones as far apart as possible. Did the dog take off for the first one, then suddenly stop and seem confused by the presence of a second, third and fourth bone? Was the hound temporarily paralyzed by too many options? Did the hound go round and round in needless circles, wondering which choice to make? If and when your now-hyperactive hound tries to focus on one bone over the others, her attention has a “deficit” because she cannot follow through by simply focusing on one object. When the hound finally makes up her mind to go after one of the four bones, the usual thrill of sitting at peace and enjoying it is now minimized. She cannot forget there are other bones still out there! She may take one bone over to the other in an attempt to gather more than one, but it does not matter. She can never sit and savor any of them. The ultimate, simple joy of dog with a bone is gone. She is over-stimulated. In fact, the poor dog is locked-up by thinking about those other three bones. In this case—the bone in the mouth is not better than three in the bushes. Now consider all the stimuli we are assaulted with every single day. Every corporation with something to sell is chasing after us—especially pharmaceutical companies who like to help us by putting names on natural human problems and then selling us very expensive pills promising to cure ‘em. Even hound dogs are given prescriptions for Prozac these days. The answer to this inability to focus is as plain as the nose on our faces. If we want to understand the world, we need to turn down the noises in it. Take one bone at a time…chew it up…then, when fully satisfied, perhaps consider another. Now, think about the cacophony we’re drowning our kids in. We don’t allow them to have any peace and quiet in the most important, most sacred place they have—their minds. And it’s not just our kids; we are all drowning in stimuli. Then consider the nightly news, which mostly ignores what kids are experiencing first hand in their lives. Missing from television are the flag-draped coffins holding the remains of a friend’s father or mother. But the kids read about the death toll in the scroll while the anchor reads the latest celebrity news or shows pictures of the most recent shooting down the block. Meanwhile, the graphic behind the anchor’s head flips from one cartoonish image after another—all fighting for our attention like a hound dog struggling with those four bones. Then the scroll switches to tweets from pundits armed with enough ego to think their comments on just about anything are worthy of dividing our attention. During the presidential debates—tweeters scrolled below the screen explaining who blinked the most and what those blinks might mean. How do we put it in context? 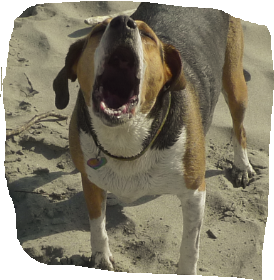 How in the world can we focus when, like a hound dog with four bones, we are never given a moment to digest anything. In steps Doctor Pharma, complete with an acronym to make it easy to remember. If speed calms down our children’s brains—isn’t there a lesson here? Gallery | This entry was posted in Uncategorized and tagged ADD, ADHD, Pharma companies love it., short attention spans, speed. Bookmark the permalink. 2 Responses to ADD, ADHD, PTSD, STDs: A-OK or SOL? The news became easier to understand as soon as I stopped watching it. Don’t know if this went through the first time–I was in a coffee shop with slow wifi–but I thought this was brilliant. Obviously you’re not the first person to say this, but it is important it be said, and you did a compelling job. I see the results of this in adults every bit as much as children, however. Just today a woman in a pickup truck who was texting nonstop as she drove at highway speeds nearly drove into a lane divider where the freeway split to go either to 580 East Bay or the Bay Bridge, all because she had her head down more than up. (She was wearing a straw hat, and I, behind her, watched as the hat bobbed up and down every two seconds.) Finally she slammed on the brakes and stopped feet in front of the divider as fifteen cars came up behind her and tried not to crash into her tailgate. After the dust cleared I passed her on the left and her head was STILL down and she was rubbing the touch screen of her little phone, apparently aware of the multi-car accident she almost caused but still not willing to get her nose out of her phone. And that was just one example today. People also stepped in front of my car in the middle of the road with their heads bent to their phones, stood in doorways and at the tops of escalators buried in their texts and chats, and bumped into me as I carried a tray of food in a food court because they had their arms out and their heads down. They didn’t even look up or say “Excuse me.” You don’t exist to them if you’re not on their little screen. How can we wonder what’s wrong with kids when the adults who raise them are even worse?